We are a technology-driven Manufacturer and Exporter of Thermoplastic Granulator. 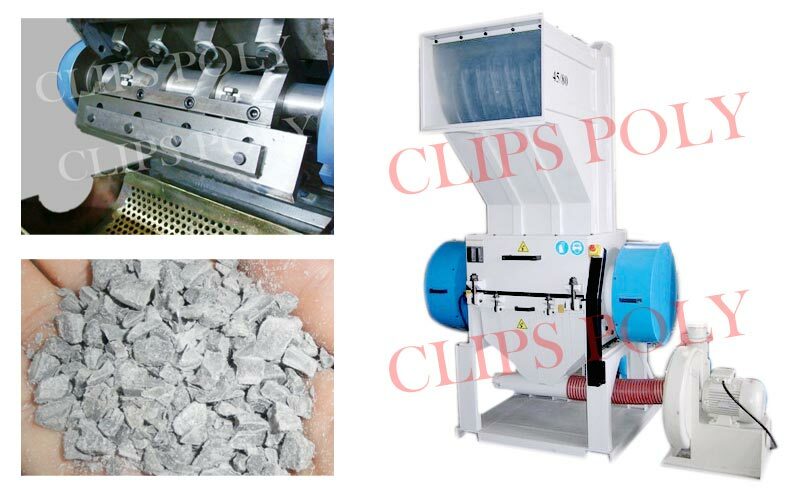 Whatever the grinding job, there is clips G series reduction solutions. The result of our rich experience is your advantage in granulating of all thermoplastic materials. Smooth running & low noise level are ensured due to a solid & compact constructed cutting chamber. The cutting blades out of a high- tensile steel are integrated in the router on their whole length and do not need to be adjusted, even after several regrind operations. The real helical cut with a constant gap between rotary & stationary blades causes low dust development & reduces the electrical power consumption. Thermoplastic Granulator is easy to use and ensures less maintenance. Clips G15 15 Dye steel D 2 4 2 15 Hp 120-150 Injection molded articles & blow moulded containers upto 5ltrs. With flash, thermoforming waste etc. Clips G20 20 Dye steel D 2 4 2 25Hp + 3 HP 220-300 Injection moulded articles, pvc pipe fittings, profiles & blow moulded containers upto 20 ltrs. With flash, thermoforming waste, pet wast etc. Clips G24 24 Dye steel D 2 4 2 30 Hp + 5 HP 250-400 Injection moulded articles, pvc pipe fittings, profiles & blow moulded containers upto 40 ltrs. With flash, themoforming waste, pet waste etc.